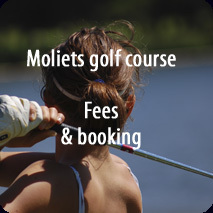 Palika Lodge is located 15 minutes drive from Moliets golf, one of the finest golf resorts on the Atlantic coast. * A 18-hole championship course (6 910 yards by 72), between forest and ocean, designed by Robert Trent Jones Sr. (1989), among the 25 best European golf. * A 9-hole course also designed by Robert Trent Jones (2 028 yards, par 31). * A teaching academy for internships and top players (fitness room, video room, Dave Pelz circuit, diagnoswing with trackman, club repair shop …). * Restaurant, pro shop, trolleys and buggies for hire. 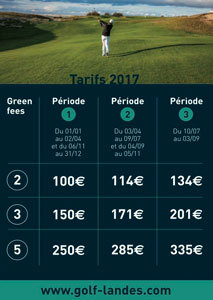 Golf Moliets is also a unique tennis academy in France with grass courts, clay courts and green set outdoor and indoor courts. 35 minutes drive from Palika Lodge. 18 holes (6 702 yards, par 72), designed by Robert von Hagge (1989). 40 minutes drive from Palika Lodge. 18 holes (6 527 yards, par 71), designed by Tim Morrison (1930). 25 minutes drive from Palika Lodge. 9-hole course designed by Pierre Thevenin (1990) with a large driving range (30 tees including 6 covered tees) on a lake, 3 putting greens and 2 tennis courts. Located 45 minutes drive from Palika Lodge, the Basque Country offers historic golf courses and enjoyable golf experience. 18 holes (6 677 yards, par 72) designed by Ronald Fream (1991). 18 holes (6 754 yards, par 72) designed by Rocky Roquemore (1993). 18 holes (5 907 yards, par 69) designed by Tom and Willie Dunn (1888). 18 holes (6 175 yards, par 70) designed by Tom Simpson (1927) and 9-hole course (1 535 yards, par 29). International Training Center course designed by Pierre Thevenin (1988) and 9-hole course (2 379 yards, par 32). 18 holes (6 379 yards, par 70) designed by Harry Colt (1928). 18 holes (6 145 yards, par 70) designed by John Henry Taylor (1907). Rustic 18 holes (5 134 yards, par 67), designed by M. Genin (1992).